We took the plunge this summer at Dollywood Water Park. 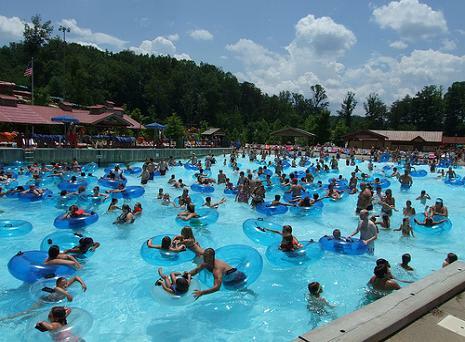 It combines the best of the Smoky Mountains with the adventure of a water park for plenty of fun for the whole family! We had a great family outing earlier this summer and really enjoyed the whole water adventure thing. After checking out Dollywood Water Park online we found there is a large wave pool, lots of water slides, raft rides and several interactive play areas for kids with waterfalls and small slides. It was another warm humid day so we decided to spend it at Dollywood Water Park. I would highly recommend arriving at the park early so you can secure chairs in a nice shaded area. Just put your towels down and go off and enjoy the park. You can always come back and relax at your leisure. We arrived at about ten in the morning and seemed to have beat the crowd. We headed for the big water rides right away before they started to get busy! We first tried the Mountain Scream which was a personal favorite of mine. Then we headed over to the Big Bear Plunge , and that is exactly what we did; plunge! The kids really liked the Mountain Twist, I think they went on it about five times each. 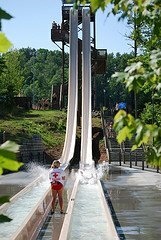 SwiftWater Run is one of newest adventure rides and is located in the same water slide complex that includes Mountain Scream and Mountain Twist. It’s a tubing bowl type ride that offers single or double tubes that take riders through a small tunnel that propels you into a large bowl area, spins you around a few times and dumps you straight down into a landing pool. The kids really liked this one and rode it several times. We had short waits and line and we rode each slide a couple of times. By the time we were done riding the big slides, the park was getting a little more crowded. We went over to Mini Melts for some ice cold ice cream and took a much needed break relaxing in our lounge chairs. Since we rented a Riverside Retreat we all decided to meet up a little later to have lunch and to avoid the long lines since the sun and heat was at its highest. We sat in the shade eating lunch while watching one of our favorite TV shows on the television that is provided at the retreat. At around 1:30pm, we decided to venture back out to Raging River Rapids and then to Splash Country’s very own lazy river, the Downbound Float Trip which is a tubers delight for every age group! You float down a river under a 200 foot waterfall, which will get you extremely wet. Fire Tower Falls is one of the tallest and fastest slides with twin free-fall slides that propel you on long tracks. They also have some great interactive children's areas that will keep the kids real busy and cool all day. The Cascadesarea is a large lagoon pool, and it has a spray geyser as well as bubblers and slides in secret coves that the kid's really have to explore. They have a large area of deck space here with lot’s of lounge chairs. Also make sure you get the kids to Little Creek Falls where there are interactive activities for even the youngest children. Bear Mountain Fire Tower is a multi-level interactive attraction that has you exploring for all the water slides, water cannons and sliding poles. Lookout when the bells sound, the gigantic bucket above will dump 1,000 gallons of water on everybody below! The fun does not have to stop at the water rides when you can spend the afternoon relaxing at one of the Dollywood Water Park getaways. You can take advantage of and enjoy Riverside and Waterside Retreats and Cascades Canopies. Here you can relax in the shade or in the sun with the family. You can reserve one of the retreats on first come first serve basis and spots fill up quickly so call in advance if you want a spot. Remember that no matter what type of Dollywood Water Park pass that you have, it does not cover the cost of the canopies nor the retreats. The Waterside and Riverside Retreats are spacious cabins that include a 27-inch satellite television, two ceiling fans, a dining table with six chairs, two lounging type chairs and a security storage facility. Each unit offers 200 square feet of shaded space, plus a 100 square foot sun deck. You can also order food and drinks to be brought to your area between 11 am and 3 pm. Another shady option is to reserve a Cascades Canopies . These canopies are relaxing and more moderate than the retreats. Here you will have two chaise lounge chairs parked in the shade with a storage locker to keep all your valuables safe and sound. Tip #1 - Check the Dollywood Water Park website and local flyers and travel magazines for discounts and coupons. Tip #2 - Get to Dollywood Water Park as early as possible to beat the traffic, best access to entrance for best choice of lounge chairs and to avoid the lines for rides. Tip #3 - If you can go on a weekday, you might find shorter lines and you will be able to enjoy your favorite rides over and over again with less waiting. Tip #4 - Since you will be there all day, remember to bring sunscreen, and more specifically, waterproof sunscreen. You’ll be in the water more often than not so waterproof is the way to go. Tip #5 - The sun is at its peak from noon to two, meaning that this is also the peak time for water rides. If you want to avoid long lines, visit the shops or grab something to eat at one of the Dollywood Water Park restaurants or snack shops. Tip #6 - Bring glasses, sunglass straps, they won't allow glasses on any rides or activities without one. Tip #7 - Bring a disposable waterproof camera for your family pictures! Tip #8 - We did rent a locker for the day and it was well worth it. We didn't have to carry everything around with us. Tip #9 - Have FUN!!! Dollywood Water Park is open daily from mid May through mid September. Hours are subject to change without notice, but the park is open from 10 am until 6 or 7 pm. For more details on the summer schedule, check out the Splash country website. Dollywood Water Park also tries to fit into your budget with options for season passes, super passes and one day passes in addition to specials and discounts that they frequently have advertised on their website. Child (Ages 3 and under) FREE!!! Arrive after 3:00 pm, Next Day FREE! (with one-day ticket purchase) Allows you to enter Dollywood Water Park after 3:00 PM and get in FREE the next operating day. The best value is a season pass. This pass allows unlimited park admission and additional benefits. If a ride requires a tube or mat to be used, it will be provided at the ride. In addition, tubes and rafts are provided free of charge on a first-come, first-serve basis for the pool areas. Also, they don't allow any coolers brought into the park. Complimentary cups of water are available at all water park restaurants and most food outlets, plus water fountains are located throughout the park near most restrooms. Be certain to visit the actual website of the owners of Dollywood Water Park for the specific instructions regarding the type of swimsuits, shirts, and ages that are admitted in the park. Dollywood Water Park is located right next to Dollywood Theme Park with the opportunity to double your fun. The parks offer a money saving ticket option to play at both parks for a lower price than purchasing separately. The best deal is that the tickets are good for 3 days and not necessarily consecutive days. Off Interstate 40, take Exit 407 toward Gatlinburg / Sevierville / Pigeon Forge. Follow TN Hwy.66 South which becomes US 441. At Traffic Light #8 in Pigeon Forge, turn left and follow the signs to Dollywood Water Park. To check out the website click on Dollywood.